What can geocoding be used for? Geocoding is the process of transforming a description of a location—such as a pair of coordinates, an address, or a name of a place—to a location on the earth's surface. You can geocode by entering one location description at a time or by providing many of them at once in a table. The resulting locations are output as geographic features with attributes, which can be used for mapping or spatial analysis. You can quickly find various kinds of locations through geocoding. The types of locations that you can search for include points of interest or names from a gazetteer, like mountains, bridges, and stores; coordinates based on latitude and longitude or other reference systems, such as the Military Grid Reference System (MGRS) or the U.S. National Grid system; and addresses, which can come in a variety of styles and formats, including street intersections, house numbers with street names, and postal codes. From simple data analysis to business and customer management to distribution techniques, there is a wide range of applications for which geocoding can be used. With geocoded addresses, you can spatially display the address locations and recognize patterns within the information. This can be done by simply looking at the information or using some of the analysis tools available with ArcGIS. You can also display your address information based on certain parameters, allowing you to further analyze the information. A few of these applications are described in the sections that follow. With geocoded addresses, you can spatially display the address locations and begin to recognize patterns within the information. This can be done by simply looking at the information or by using some of the analysis tools available with ArcGIS. You can also display your address information based on certain parameters, allowing you to further analyze the information. The annual record of burglaries was initially created by geocoding a database table of burglaries that consisted of an address for each. The screen shots above show how the geocoded addresses were presented according to time, season, and day of the week to assist in crime prevention planning. Additional analysis tools available in ArcGIS could be used to further analyze the information to identify patterns. Base data for this sample application was provided by Tele Atlas and Vexcel Corp.
Geocoding acts as a crucial part of customer data management. Nearly every organization maintains address information for each customer or client. This is usually in tabular format, containing the customer name, address, buying habits, and any other information you have collected. Geocoding allows you to take your customers' information and create a map of their locations. Using a variety of related applications, you can use this information in many ways, from establishing marketing strategies to targeting specific clusters of customers to producing route maps and directions. The geocoded locations of your customers can be invaluable data. ArcLogistics is an application that uses geocoded addresses to optimally plan customer deliveries. You can use various methods to share your geocoding functionality. These include everything from collecting the address locators and sharing via a compressed file or compact disc to developing an online application, allowing users to do geocoding over the Internet. Many real estate firms have found advantages in distributing information about available real estate via the Internet. By combining the database of available homes and ArcGIS Web services, you can distribute the spatial and nonspatial information about a home to a wide audience. In the real world, you find locations based on some description. This might be a number and street name. It might include the name of the city, state, or country or natural features, such as a drainage basin or ecological region. For example, if you needed to locate the address 380 New York St., Redlands, CA 92373 with the right street map, it would not take you long to find the exact location. 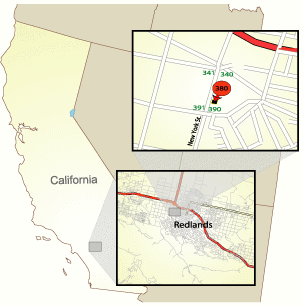 You might first find California, then find the city of Redlands. You might also use a postal code map and locate the region covered by the corresponding ZIP Code value. You would then locate the street and interpret where and on which side of the 300 block the address is located. Just as you found the address by narrowing your search to a specific region, finding a particular feature, and interpreting a point along that feature, the computer is doing the same process to assign a location to an address when geocoding. Geocoding starts with a textual description of a location and translates that into the x,y coordinates that can be plotted on a map. Your first step when you want to find something on a map is to have the right map. There is no way you will find your way to 380 New York Street in Redlands, California, if you only have a map of Canada. Also, you won't be able to pinpoint the address very well if your map only shows highways and major cities. Your map must have enough detail of the area to pinpoint the location for which you are searching. It is no different when geocoding in ArcGIS. The layers that you use for creating an address locator, known as reference data, need to have details of the specific point you want to find. When looking for addresses, the primary reference data usually consists of a street network, but a parcel map can be used as well. The important thing is that the data has the detail that you want to find. The address locator is the major component in the geocoding process. An address locator is created based on a specific address locator style. Once created, an address locator contains the geocoding properties and parameters that are set on the Address Locator Properties dialog box, a snapshot of the address attributes in the reference data, and the queries for performing a geocoding search. The address locator also contains a set of address parsing and matching rules that directs the geocoding engine to perform address standardization and matching. Think of the address locator as a street guide or map book that you use to look up an address; it directs you to the page and pinpoints the location of the address. When you enter an address you want to find, the geocoding engine converts the input address into pieces, such as number, street name, and street type, based on the parsing rules defined in the address locator. These pieces are known as address elements. The geocoding engine may generate multiple interpretations of the same address, as some values in the input address can be considered in more than one element. For example, the word park can be both a street name and a street type. Each combination of the address elements will be searched in the address locator. The goal is to find all the possible matching candidates. Once possible candidates are identified, each individual variable in the candidate is compared with each corresponding address element. A score is generated indicating how well the address is matched. Finally, the address locator presents the best matches based on the score and the location of the address being matched.